Note: While this review will be spoiler free, it will reference previous books in the series. If you haven’t started yet, check out VBC’s review of book 1, Spider’s Bite. Gin’s birthday is just around the corner which means it’s been nearly a year since everything in the Elemental Assassin series started. Nearly a year since Gin found Fletcher murdered and truly started up her revenge with Ashland’s underworld leading to her showdown with Mab and all the repercussions that followed. A lot has happened to Gin in this one year and things don’t seem like they’re going to let up anytime soon, no matter how much Gin wishes they would. This time trouble comes in the form of Beauregard Benson (love that name by the way), a nasty vampire in the drug business with a penchant for studying the effects of his ‘experiments’ (i.e. the addicts). Bria has been trying to pin down Benson for months with no success. When Gin and one of her waitresses are witness to Benson’s particular form of punishment, Bria wants to use whatever means possible to arrest Benson even if it puts someone else in danger. Not liking Bria’s new style of police work, Gin is ready to step in and do what she does best, even if this is one time she would love to stick to the sidelines. 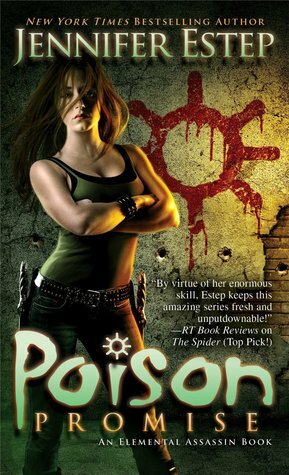 Readers of this series know that it tends to follow a specific pattern; Poison Promise is no different. Jennifer Estep still manages to write a quick paced story that I didn’t want to put down, so I can’t really find fault with the pattern. I always have to give credit to Estep for writing such interesting, twisted villains for Gin to fight. In Beauregard Benson we have a vampire with a little extra side of power that Gin hasn’t come across yet. He regards his interactions with the world as more of a science experiment than anything else, just hoping to get some kind of reaction. Obviously, he gets frustrated with Gin’s being the ever patient Spider. For me Poison Promise felt tired. This is not an indication of this book being boring by any means; it’s more reflective of Gin’s state of mind. She’s tired, plain and simple. Tired of fighting everyday because some bigwig in Ashland wants to declare themselves the top dog. It’s truly a no-win situation for Gin, and the inevitable fight with Benson only solidifies her position as a power player herself in Ashland, whether she wants it or not. It makes me wonder if maybe Poison Promise is the start of winding the series down to the end. Readers of the series all know that there is at least one final showdown coming for Gin. First mentioned at the end of Deadly Sting, Estep has been building up the mysterious M.M. Monroe for a few books now and M.M. finally makes their grand appearance in Poison Promise. I’ll say that, while not surprised in the least when we finally come face to face with M.M. Monroe, I did like the character and the interesting conflicts she posts for Gin and her friends and family. I think M.M. will prove to be a trickier opponent than those Gin has faced in the past. Although I’ll admit, and Gin herself even makes this association, that it feels a bit like déjà vu. I’ll be really interested to see if Estep plans to continue on after Black Widow comes out this winter. I can’t believe it’s only be one year. WHAT a year. I loved this one. It is strange to think it’s only been a year in the storyline. So much has happened!